A lot of great food in Taiwan is pretty inexpensive. Therefore, I propose a Pokemon approach, try to catch ’em all. Here is a scavenger hunt list, download a simplified version in hard copy here. I am most nostalgic about breakfast food in Taiwan. On the few trips there when I was a kid, I remember waking up to find my mama already returning from a morning stroll to get Taiwanese breakfast for us, featuring crunchy-flaky fried crullers and fresh warm soymilk, maybe with green onion pancakes. A hot place to get fresh soy milk in Taipei is: FuHang Dou Jiang (阜杭豆漿). Expect a long long line, but it’ll be even tastier for having waited. I showed up early and was in line from street-level, up a flight of stairs, and into the food court where they were taking orders. Happiness can be so affordable! When I went, a very good green onion pancake at 北方油餅 (Beifang Green Onion Pancake) was 50NT, about $1.66 USD. I got up early on a Sunday morning to catch one of the first ones and skip the line, and I put on my dorky foreign tourist hat to take a video so you could experience in full color video, the making of a 北方油餅 (Beifang Green Onion Pancake) -with egg! Video is at the bottom of this post so as not to disrupt the flow of your reading. Through the magic of the Internets (i.e. user manuals online) I know that my fancy Sanyo 5-cup rice cooker (a long ago wedding registry gift) can also steam food, make porridge, work like a slow cooker, do all of these things at a set time in the future, and, in theory, make tofu. * Sorry in advance for the length of this entry, but the number of steps and attention to pay corresponds..
Why would anyone make tofu? That’s gross! No my friend, I love tofu. Not the flavorless, grainy, mealy-textured stuff you find at the Western groceries, no, the soft, velvety smooth (still pretty flavorless) stuff from the Asian groceries, or the stuff they sell in the back of Northwest Tofu, a Seattle-based Taiwanese breakfast establishment. A light, refreshing snack if you cut it cold in chunks, pour a little soy sauce over, and sprinkle lightly with MSG-laden furikake (admittedly not the healthiest choice). ..or a good melt-in-your-mouth mild complement to spicy pork and sauce in mapo tofu. ..or fried tofu, crispy and salty on the outside and melty on the inside, like a deep fried cheese curd but probably better for you. Still not convinced? That’s okay, you can just skip this entry. As for me, I’m stickin’ to my roots and giving this another try (mainly for the novelty). For this one, I just tried to follow the manual instructions to the letter, only moderation was that I started with just-boiled water from the percolator. 1. Rinse tofu container with hot water just before adding ingredients. 2. Add 500 ml (2 cups) boiled water to the outer rice cooker bowl. 3. Add .34 oz (wtf?! Who uses ounces? google told me this was about 2 tsp) nigari, which apparently is “a natural coagulant of magnesium chloride made by evaporating seawater,” per Pat, of The Asian Grandmother’s Cookbook. 4. Set rice cooker to ‘tofu’ setting. 6. 1 hour later: done. Hahahahaha. Steps 4 and 5 are zingers if you don’t have a fancy schmancy rice cooker, right? AAANNdd in the OPPOSITE CORNER, our manual method, ALSO hailing from the internet, from The Asian Grandmother’s Cookbook (a since-defunct website), Homemade Tofu – No Fancy Equipment Necessary! I’m not going to list all the instructions here since the aforementioned link does it better. Just know that I did half the portions. As I was pouring the soymilk (only bought one day ago!) into the pot to boil, I could smell the aromatic deliciousness and chickened out of making the full 4 cups prescribed, choosing selfishly instead to hoard an additional 2 cups to drink in my morning coffee, or maybe even just warmed up with a little sugar stirred in..mmmmm. Maybe it was the halving of portions (but still boiling in a large pot), or maybe I added too much nigari, or too little, but this one turned out a little firmer than expected. 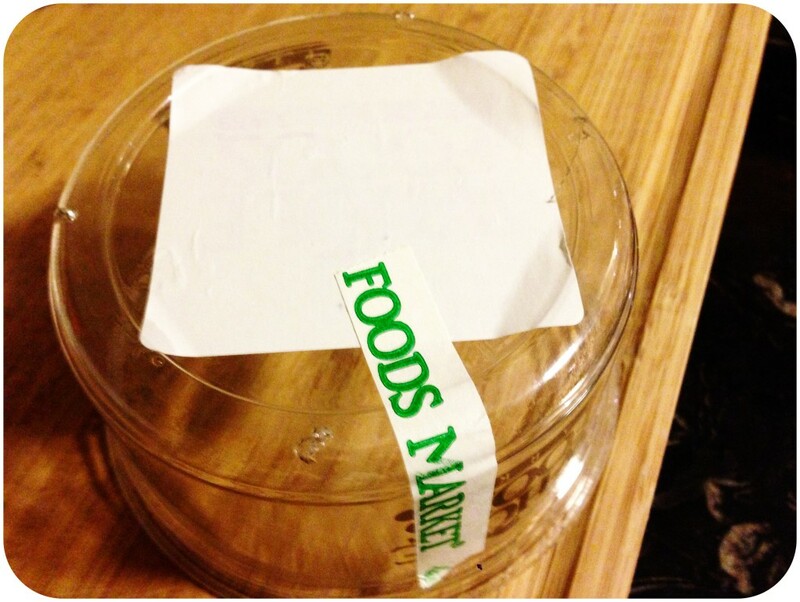 Since I used an old Whole Foods container as a makeshift tofu press (just stuck holes in the bottom for drainage -had to pause while draining to poke the holes bigger-) and I ended up with a surprisingly small amount to work with, I ended up with a bit of a funny round shape, which did not photograph well. However, the flavor was delicious. As of the writing of this I have already ‘snacked’ on half of it! 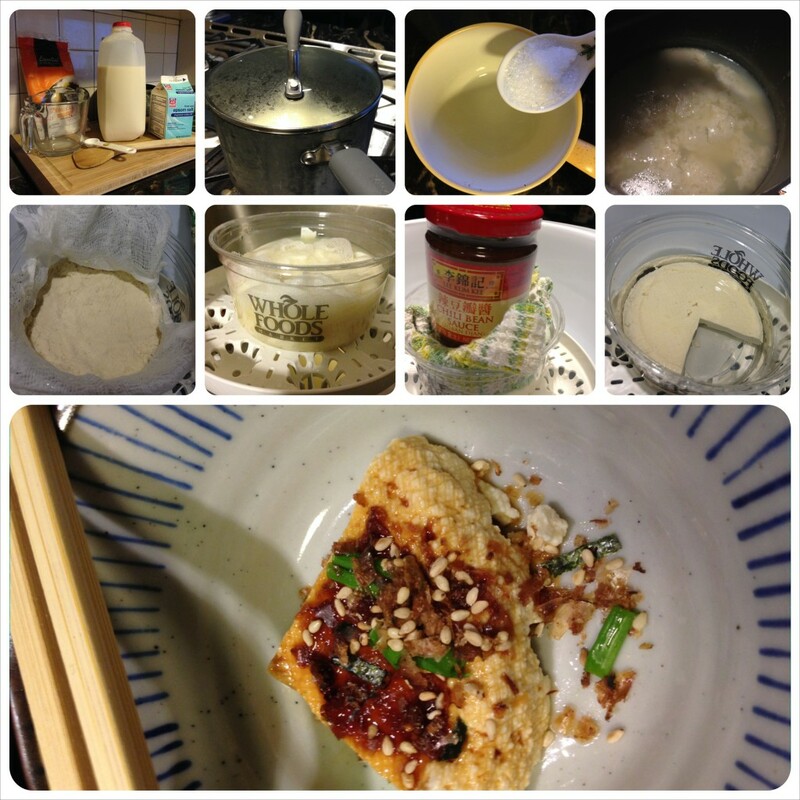 Manual tofu method: many many more steps and attention paid. The epsom salt reads “saline laxative,” mmmm. I noticed I had 8 minutes to spare after making the manual stuff before the cooker was due to be done. How did these two methods stack up? Time: it’s sort of a toss up, since the manual is shorter, but you don’t have to touch the rice cooker one after you set it. Flavor: manual tastier. About 2/5th of the rice cooker tofu was eaten for dessert at dinner, but only out of politeness and with honey to mask the odd chalky taste. 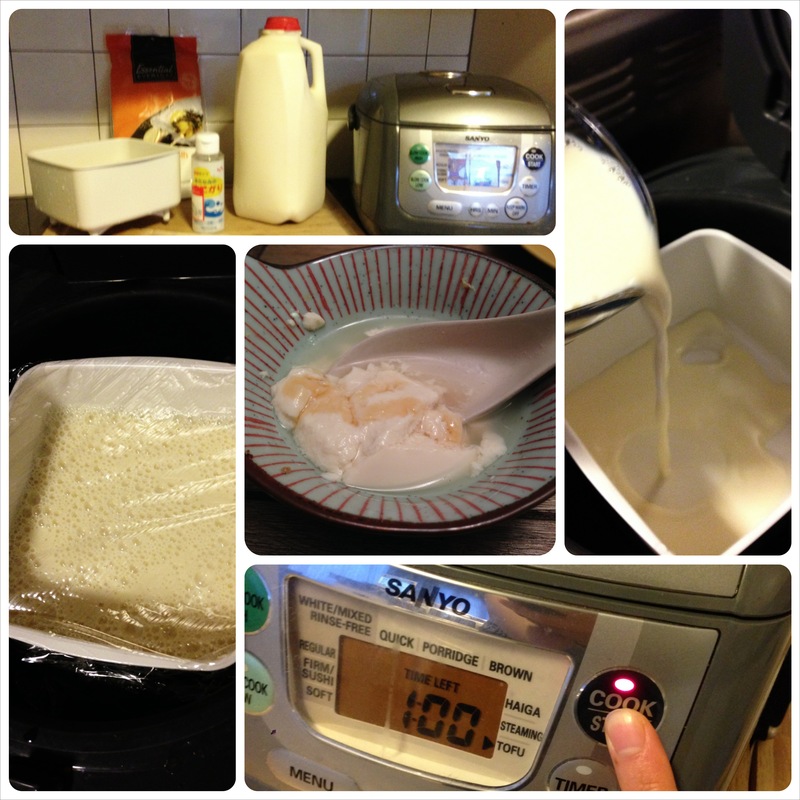 Texture: the rice cooker tofu was lighter and more airy, which is the way I like my tofu. I shouldn’t be too surprised since the other recipe mentioned how the author likes firmer tofu. I think taste always trumps texture, since you can do something about texture, but if you start with an awkward taste, it can be hard to escape. If I made a lot more, I could totally turn that manual method tofu into mapo tofu and you wouldn’t care about it being a little firmer. I think next time I’ll try the rice cooker method with epsom salt and see how it goes. It’s possible it has a different coagulation rate and it won’t work at all, but it’s worth a shot. Also of note: happy birthday to my friend whose birthday was on Sunday! It was an honor to treat you to delicious brunch, and have an excellent excuse to pick up fresh soymilk from Northwest Tofu. You seem wiser and happier with each year, and I wish you many more. I think next time I’ll try the manual tofu recipe with a little less epsom salt, but in the rice cooker. *Oh, and you can make hard [over]boiled eggs. Just throw it in with the rice next time and see. Also learned from my manual-reading: turns out my oven has a “Sabbath Mode.” Who knew? 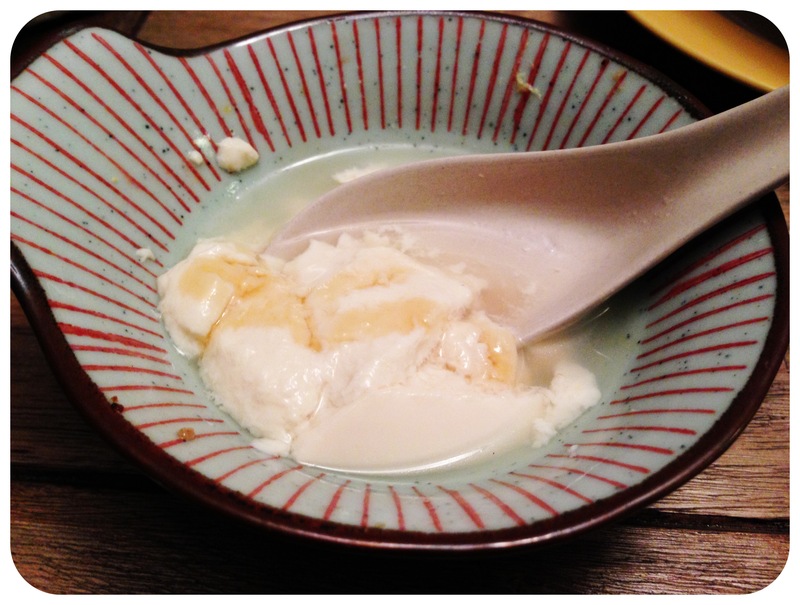 Incidentally, in the course of checking directions on how to steam soft-boiled eggs the other day, I found this article: Surprising Things You Can Cook with a Rice Cooker, with a bunch of appetizing pictures with recipe links. I’ve saved the wheat berry salad and mac & cheese recipes to try later, although I am still a little wary of trying to make anything that needs crunch in a rice cooker. The mac & cheese may be too many intermittent steps, and the delicious-looking Lemony Risotto with Shrimp definitely was. Then you might as well do it on the stovetop. Let me know if you try any of these and want to do a guest blog post!